At this point, there's really nothing to say. The Eagles should have had a 50-yard FG at the end of the half, and there should have been about 4 seconds on the clock. Vick scored with 12 seconds left, and they ran it to 10. 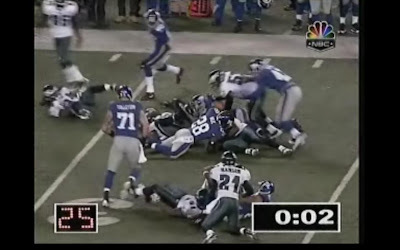 The fumble recovery occurred at 2 seconds left, and it ran to zero. But Goodell will tweak the celebration rules before the clock operators. lets go green and bring in sun dials. Apparently Mexican fashion < games in Europe. This isn't Russia Danny, is this Russia?